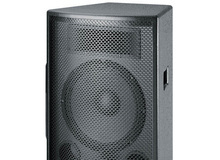 Line 6 StageSource L2t - "Quality speaker with great features"
Behringer Eurolive VS1220 - "Good sound at a GREAT price!" JBL JRX115 - "The Bass was not good!" Behringer Eurolive B215XL - "I did not like the sound it gave to guitars"
JBL JRX125 - "Go JBL"
Peavey PVX 15 - "best in this price range"
Peavey PVX 12 - "clean"
Nexo PS 15 - "Clean sound, just add a woofer"
Peavey PV 215 - "Pair of them"
Beta Three RS15 - "Love using the RS 15"